Note: You can enter this giveaway three (3) times per e-mail address per day. Deadline is 11:59PM ET 7.1.18. If you vowed to make more meals at home, this 15-piece cookware set from Paula Deen will get you on your way. Both the durable, stain-resistant, speckled porcelain exterior and nonstick interior are easy to clean and the heavy gauge construction heats quickly and evenly so you can make perfect Shrimp and Grits. 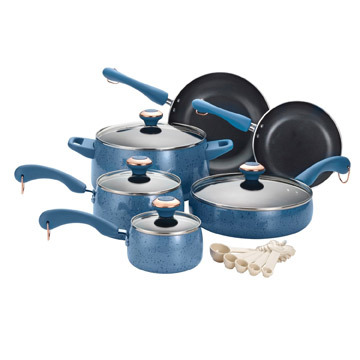 This set includes a 1-quart covered saucepan, 2-quart covered saucepan, 6-quart covered stockpot, 2.75-quart covered sauté, 8-inch and 10-inch skillet, and a 5-piece measuring spoon set. The tempered glass lids lock in flavor and allow you to keep your eye on things, like a classic Coq Au Vin, without lifting a lid. NO PURCHASE NECESSARY TO ENTER OR WIN. Void where prohibited by law. Open to legal residents of the 50 U.S., D.C. and Canada (excluding Quebec) who are at least eighteen years old at the time of entry and have internet access. Begins on 5.5.18 at 12:00:00 a.m. ET and ends on 7.1.18 at 11:59:59 p.m. ET. To enter the giveaway, submit your full name and email address on this form. Odds of winning this giveaway depend on the total number of eligible entries received. Only three (3) entries per email address per day. Sponsored by Leite’s Culinaria, Inc. For more information, visit our Official Rules. For a list of winners, check out our Very Happy Winners page. Be sure to add giveaways@leitesculinaria.com to ensure notification if you are the winner.